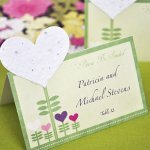 Welcome to our unique wedding and bridal shower favors and gifts collection. Shop these pages for unique, personalized favors for your bridal shower or wedding. Find special gifts for maid of honor, bridesmaids, best man, ushers and all members of the bridal party. This collection of wedding showers and gifts includes special seasonal gifts, too. If you're having a holiday wedding, summer anniversary party or other special season theme event, you're sure to find high quality personalized favors and gifts in this collection. 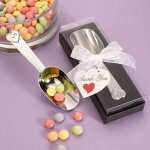 Description:Candy scoop party favors are the perfect party favors for weddings. Packaged in a deluxe gift box with ribbon. 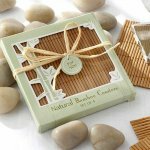 Description:Give the gift of lucky bamboo with these practical and eco-friendly natural bamboo coaster favors. These coasters are perfect for any Asian or eco-friendly themed event. 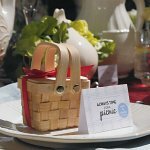 Description:Simply too cute to be believed, these mini woven picnic baskets are bound to inspire squeals of glee. Perfect as favor boxes for an outdoor wedding or bridal shower--though you'll want to use them for every occasion under the sun! 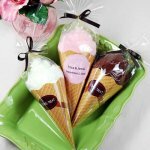 Description:Treat yourself and your guests to these ice cream towel favors. Choose from chocolate, vanilla and strawberry designs.They are perfect as summer wedding favors. 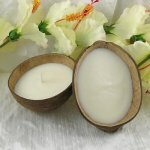 Description:Beautiful and exotic, these scented coconut candles are lovely guest favors for romantic beach celebrations. Place one candle at each guest's place setting or display them in a large basket near the entrance of the banquet room. Description:Your guests will be pleased with these personalized wedding koozie favors. 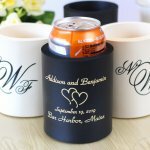 Choose koozies for cans or bottles then get ready to go wild customizing each with the wedding-themed design of your choice. 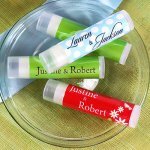 Description:These personalized lip balm wedding favors have been designed exclusively for beau-coup favors. in designs perfect for beach themed weddings, asian weddings, las vegas weddings and many more. 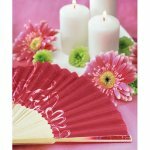 Description:For outdoor, garden parties or summer weddings, these contemporary hearts silk fans are the perfect favors. Personalize with a matching sticker on the panel for added touch. 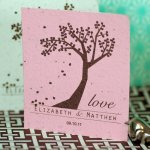 Description:Personalized plantable seed favor cards for an eco-friendly wedding favor idea. 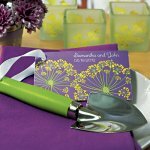 Description:Share your love and watch it grow with these eco-friendly plantable seed place cards. Description:Your guests will love this mini garden shovel. 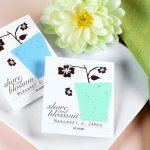 Great as party favors for any occasion such as a garden themed bridal shower or wedding reception. Each shovel features a green handle and measures 7" long. Description:These love bird place card holders are a sweet way to adorn your wedding reception tables. 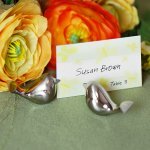 Each lovely little silver bird holds a place card in its beak. Perfect as spring wedding favors and garden party place card holders. Description:Mint tin wedding favors in exclusive designs. Personalization included. Only at www.beau-coup.com. 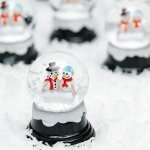 Description:Our miniature winter wedding snowglobes are popular and romantic wedding favors for a winter wedding or bridal shower.